Shrewsbury – Hannah Iaccarino, Shrewsbury resident and Dartmouth College student, is one of a 13-member crew spending summer vacation traveling across the country in the seventh annual Big Green Bus tour. In 10 weeks, the bus will travel 11,000 miles through 40 states, along both coasts, and return to Dartmouth, in Hanover, N.H., Wednesday, Sept. 7. 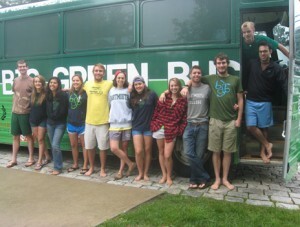 Since April, the crew has spent countless hours converting the bus. Donated by Greyhound, the coach bus is described by crew members as “very used” when it was given to the Big Green Bus program. According to the crew, each “green” bus is used for a few years and because this is the first tour for this bus, the crew prepared the bus from scratch. Although the group has an advisor at school, Iaccarino explained that the students do everything on their own. The crew reports that they are often asked how they all sleep on the bus. Erik Skarin, an engineering and environmental studies student from Sunapee, N.H., is one of the crew members who converted the bus to run on waste vegetable oil. Iaccarino, who got her CDL Class B license and is one of five drivers on the trip, described a day on the bus. Iaccarino will be entering her senior year at Dartmouth studying neuroscience and described the trip as her ultimate adventure.